It’s been a good day for bees in our garden. There were four species buzzing and humming round our wild flowers fairly constantly. The first one to attract my attention was during the morning when it was quite overcast. I think it might have been a tree bumble bee. It certainly fitted the description – black head, brown-ginger thorax and a white tail. The plant it was visiting was also new to me, but following a bit of research we decided it was viper’s bugloss. It was obviously very attractive to that species of bee because I noticed similar bees returning to it throughout the day. 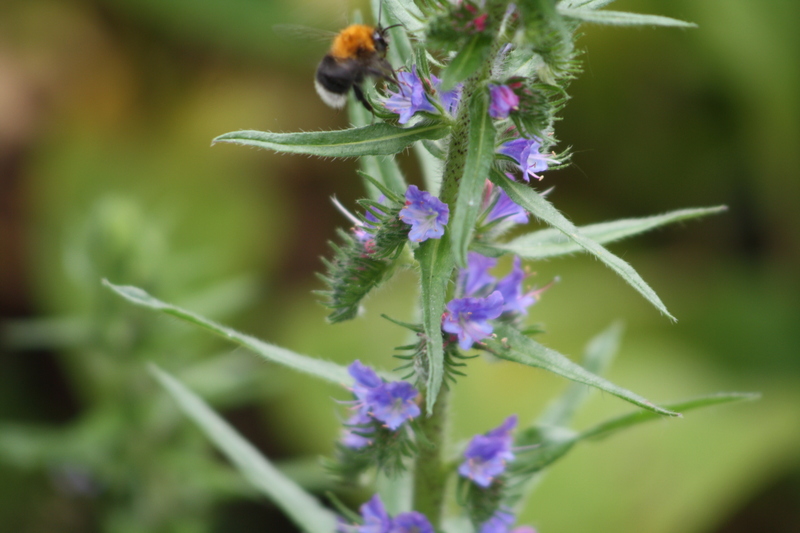 The tree bumblebee on the viper’s bugloss. The next bee had a yellow collar, yellow round its “waist” and a whitish tail and had a preference for foxgloves. And another bee was small with yellow tufts on its black head. It also had a thick yellow collar round its shoulders, with a yellow band round its middle, a black abdomen and an orangey red tail. It was on a pompom type flower. Feeding from white clover was another small bee, completely black this time, but with a red tail. Perhaps they were a male and a worker of the red-tail bee species. Here are two more of the bees seen today. I briefly saw a honey bee. And a very large bee also turned up, first popping into a flower on the foxglove and then going to rest in a sunny spot on the fence for a few moments. Similar bees to all of these have visited our garden recently. While watching the bees, I also noticed a hoverfly which buzzed noisily when disturbed by another insect – it was probably pretending it was a bee or wasp which could sting. 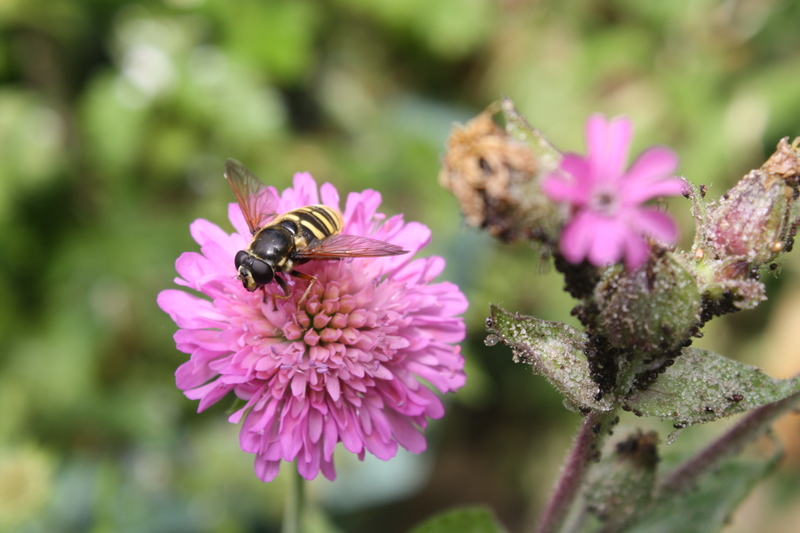 I watched the hoverfly as it settled on a flower head, and proceeded to clean its front legs. And a seven-spot ladybird was on a dead leaf on the grass. I hope to send the results of my bee sightings to the Great British Bee Count, run by Friends of the Earth until the end of this month. 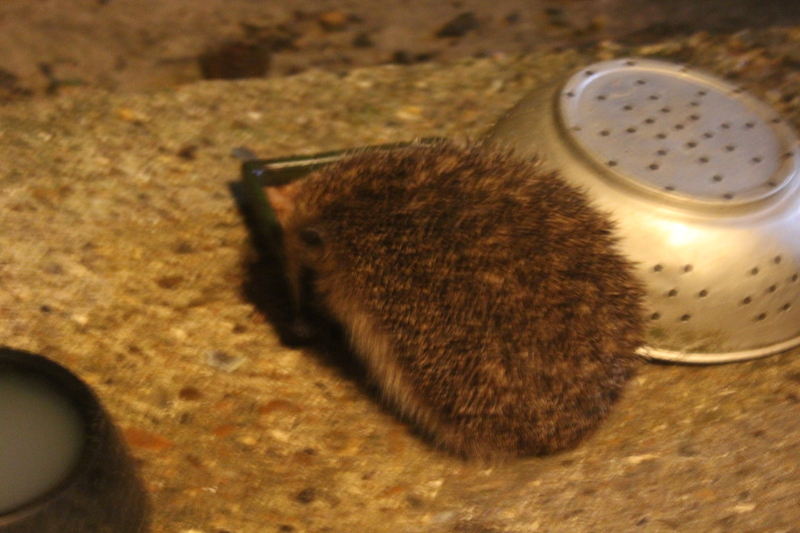 On a rather different note, my son, Stephen, managed to get a photo of a hedgehog which came to feed at our doorstep last night. We have been leaving out bowls of food and water for passing hedgehogs for several years now but they often don’t turn up until we’ve gone to bed! This hedgehog came to our doorstep cafe. Thanks for the information to help with bee id. I ought to have known the plants were scabious – temporary mental block! Thanks for reminding me.